Are you happy to have “satisfied” Guests? The better question should be, “Are your Guests ‘engaged’”? Guest engagement may be a goal of your hospitality ministry, but there’s another type of engagement you must first address: team engagement. 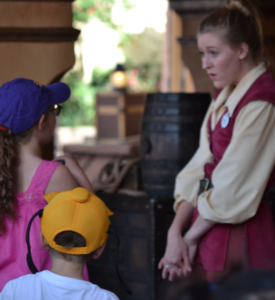 On a recent Guest Experience field trip to Walt Disney World, I spent 3 days observing Cast Members, talking with them, and photo-documenting their interactions with Guests. Disney Cast Members know about engagement. This set of photos illustrates what I am talking about. A large crowd of Guests have just watched Captain Jack Sparrow‘s Pirate Tutorial and now they are headed to experience the Pirates of the Caribbean attraction. Your attention is first drawn to the Guests, but look in the background, and you will see a Cast Member, one of the hosts for this attraction. It’s her role to usher as many Guests into the attraction as quickly as she can. …because that’s where her center of attention – her engagement – is directed. 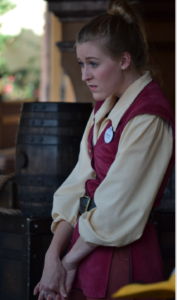 At this moment, the Cast Member is not concerned about the large number of Guests coming her way, or the number of Guests she needs to move through the lines – she is only concerned about the two Guests right in front of her. You can bet that the two young Guests were grateful for the help they got from this Cast Member. As a result, they were more fully engaged with the experience to come. 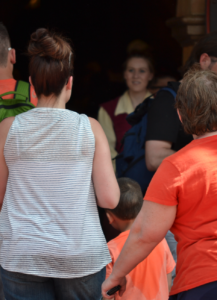 The success of this interaction, which took just a few seconds in one attraction in one of Walt Disney World’s multiple theme parks, resorts, and water parks, is repeated hundreds of thousands of times each day. As a result, the experience at Walt Disney World is consistently given some of the highest customer (Guest) service marks in any industry worldwide. Measured another way, Disney has a Guest return rate of about 70% (Be Our Guest, p. 5), which is very high. Of course, the Disney organization is a business, so the bottom line is very important to them. But for over 60 years, the Disney organization has realized that front line equals bottom line. 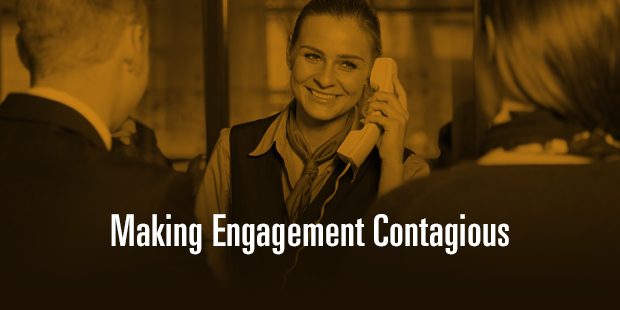 The success of Disney’s front line in engaging Guests determines their bottom line. Engagement of the Guest may occur on the front line, but that engagement is only made possible because Cast Members are first engaged by Disney culture in the importance and value of Guests. From the initial interviews throughout the hiring process, the onboarding, and through ongoing on-the-job-training, Cast Members realize that “We train them to be aware that they’re there mainly to help the Guest” (Walt Disney). Guest engagement starts with team engagement. 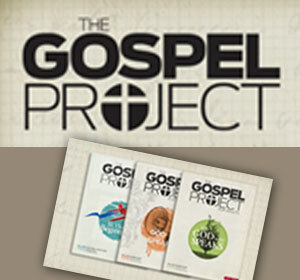 Your church is not a business seeking to have return customers who will in turn spend more money. But your church IS interested in welcoming Guests and members who will encounter God, become connected, develop relationships, and serve God in ministries in your church and in their daily lives. Now that’s a bottom line worth investing in! So the question becomes, how are you developing engaged team members? 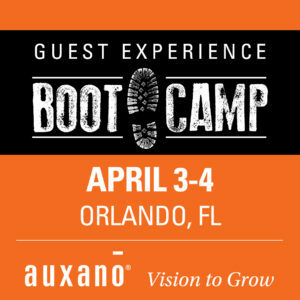 Learn more about training your teams at Auxano’s Guest Experience Boot Camp in Orlando, FL on April 3-4. Learn more here.